As Hurricane Sandy hits the East coast, it’s probably too late for impacted businesses to make any significant changes to their telecommunication network, to keep it operational during the storm. Disaster Recovery and Business Continuity are extremely important in today’s competitive economy. If your business phone lines are down during a natural disaster and you can’t be reached, it could become a concern to your customers and prospective customers. If you use Voice over IP, your voice communication depends on an internet connection. If your internet goes down, so will your phone service. Internet access becomes more critical with the use of VoIP so it’s important to have a secondary internet connection at each of your business locations. If you are using T1, a cable internet connection is a better choice over DSL, because cable is delivered over a completely separate network. Also, many providers can automatically move your calls from a VoIP service to analog lines, in the event of a failure. Disaster Recovery on both ends of the call. PRI (voice T1) voice traffic can also be rerouted to POTS (analog) lines. You’ll lose a number of voice lines, but you’ll still be able to receive calls from your main phone number. POTS and PRI ride on the same facilities, but analog lines have a built in power source, which makes them more dependable. Consider that the local phone company delivers all the local loops (the wiring extending from your location to your provider’s point of presence) for T1 and PRI in a given area. They also deliver the POTS or analog phone lines, even if you purchase that service from another provider. If you purchase business DSL service from one of the incumbent’s competitors, it’s still going to ride on the incumbent’s phone lines. Purchasing a T1 from the incumbent and another T1 from a competitor does not produce any real level of redundancy. Fiber internet connections, on the other hand, are typically carrier specific. Meaning, if you had a fiber connection from Time Warner Cable and another from Verizon, for instance, they would be completely separate and redundant. No matter what business phone or internet service you’re using, if you lose power, you’ll lose your ability to receive and make phone calls or transmit data. Analog phone lines have a power supply but the phone equipment connected to the lines most likely requires electricity to operate. Battery backup can provide power for shorter durations. Gas powered generators can be used for longer periods of power outage. Hosted phone systems and IT solutions can allow you to experience more uptime than you might experience with premise-based equipment and services. Hosted providers practice disaster recovery and possess multiple power supplies and paths to the internet. If one of your business locations is closed due to weather or for any other reason, your calls can be rerouted remotely to a location unaffected by a storm or other natural disaster. If your business is made unavailable during a disaster, it would be possible to connect from a separate internet connection and access company programs and software. In this day and age, there’s no excuse to be unaware or uninformed. The internet, cable news and radio provide updates around the clock. The Federal Government provides storm updates on www.ready.gov and on Twitter @readydotgov. 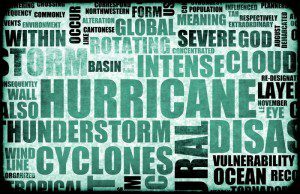 It might be too late to improve your company’s Disaster Recovery before it feels the effects of Hurricane Sandy, but it is a good time to monitor the strengths and weaknesses of your current network configuration. Every area of the country faces its own threats and possesses its own infrastructure. Where is your network most vulnerable and what steps can you make to keep your company up and running during the next exigency? CarrierBid has over 180 carriers and service providers available to help you execute your disaster recovery plan. Let us use our experience and intellectual property to assist and advise you with a holistic approach as we analyze your IT and business options. For immediate service, or to schedule an initial consultation, please call or fill out the form below and an expert will contact you right away.